Projected in a space elevated 20 inches onto two wall surfaces measuring 8' x 16' with a 60° joining angle. This work is a reflection; a wondering of the past, present and future. It brings into question what is real and what is not. The relationship between space and time is unrecognizable. By negotiating the unknown, we balance and navigate through uncertain times. We face solitude and spells of loneliness. The value of this work lies in the suggestion of comfort, of knowing that with human connection, we are not alone. I worked for a month at Arteles developing a costume and character. I experimented with props and brainstormed ideas for a narrative searching through what was unfamiliar and reflecting upon being somewhere so isolated and far away from home. The following month I met Myriam and Jose. We shared ideas regarding myth and reality, femininity and expectations, and a need to experience the natural world. With histories in visual arts, performance, cinematography and animation we discovered the strength of combining conceptual ideas and skills. We worked together during the remainder of our time at Arteles and continued to develop and finish the project post-residency. This is a story about isolation and solitude; pattern and ritual; uncertainty and uncomfortable transitions; when beauty and grace seem infinitely far away. It is inspired by living in the north and experiencing the relationship between place and navigating through it in the most challenging times. 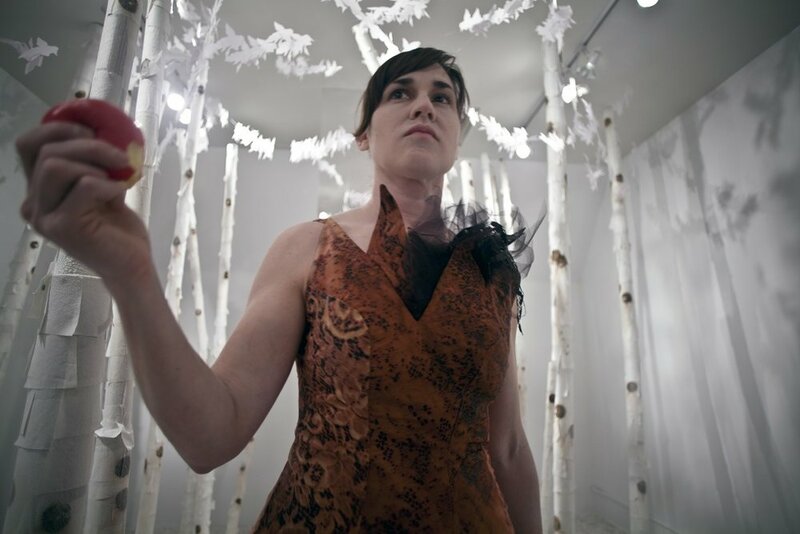 In this performance of Weathered, Amy Johnson continues a dialogue between artist and viewer to expose deeply rooted ideals born from myths and fairytales that have been glamorized throughout history and now saturate modern day life. Living in an environment with extreme weather, drastic changes in light and dark, where we mostly walk on unstable frozen ground we are challenged to be resilient and persevere not just through daily life but also through a seemingly inhabitable space. By using place as a metaphor, Johnson deconstructs the romantic perception of life in the north and conveys her experiences of solitude and endurance in an unfamiliar yet enchanting world. 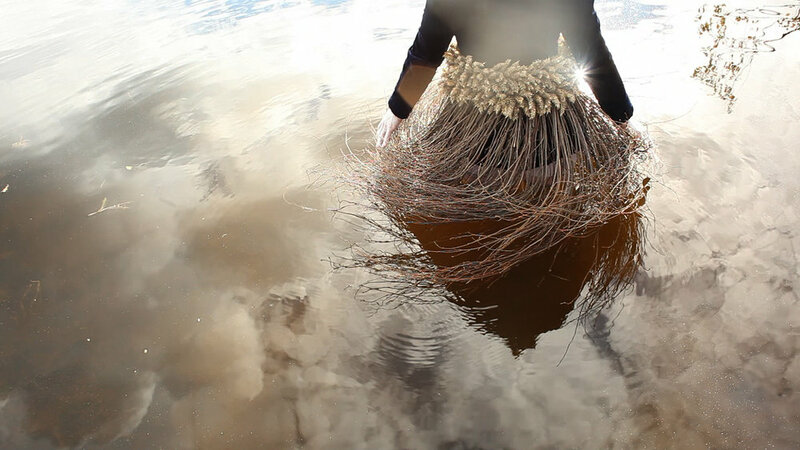 The wonder of The Matanuska Project lies within a female archetype and the mythical narrative surrounding her. These images juxtapose the severe landscape and the human presence shifting back and forth between hard and soft, comfortable and uncomfortable. This present contrast reveals questions about sense of place and explores landscape as metaphor for human endurance. The unspoken dialogue between character and landscape is tense and mysterious. It is a self- conscious journey full of unknowns and doubt, but encouraged by a romantic place. The presence of mystery suggests a transformative way of taking in the world. It reveals a process of deconstructing the poetic and fantastical to expose the harsh realities of modern day life. This body of work weaves together layers of sociology, uncovering myths regarding gender expectations, roles and emotional responses to uncertain surroundings. By pushing the exploration of character, this collection of photographs maintains the emotional intensity of feeling constantly exposed, vulnerable and solitary. Its narrative reveals the nature of getting lost in the seduction of beauty and grandeur, and the subsequent realizations of the gruesome truths of how to endure and persevere through the unknown with grace and resilience. …the queen bee’s place lies between head and heart, and the drones become the cells, which are constantly renewed. The whole builds a unity, which has to function perfectly, but in a humane warm way through principles of cooperation and brotherhood. Queen Bee is a culmination of ideas and critique of fairytales with an investigation of their relevance to contemporary culture. Fairytales introduce an idyllic world. They present narratives with trickery and darkness, but always conclude with happily ever after. This work suggests the seductive nature of getting lost in the attraction of beauty, and realizing the gruesome truths of myths. My role as an artist and my motivation for working is to offer an empathetic response to the painful contrast of these dreams and our reality. Considering the social norms of modern day and the roles that are associated with gender, Queen Bee reveals the history and questions the recurring themes connected to female socialization. My relation to the queen and her primary function of reproduction are a reflection of the expectations and responsibilities of women in our society.